It's that time of year again! Dance recital time! Q's toddler dance hairstyle is usually pretty basic, the teacher tells all the little girls in her class how she wants their hair and I comply! This time was a "Curly Ponytail" ....Good thing, since curly hair is what you get on this little head! Q's curly hair is really the underneath hair however, so since the teacher specified a "curly ponytail" I wanted to put in a little extra effort to get those curls to pop. I used the matching costume clip to bring some of the straighter parts up and away from the curlier hair. I'm not so sure it really worked! But I tried. and then later I took it out and just let it be a normal ponytail with the dance costume clip. Here she is getting her tap shoes on before the dance recital! You can see here how I clipped some of her hair forward, it's not all just hanging down from the ponytail. 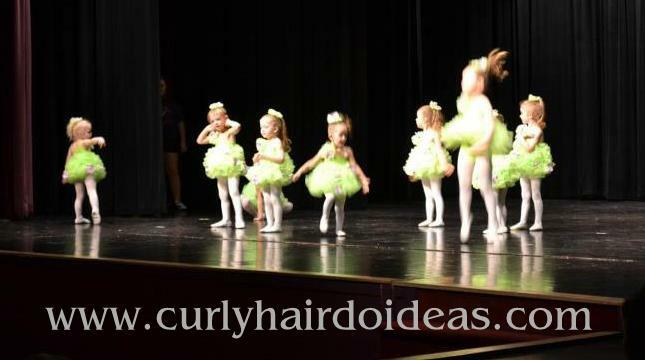 More fun dance recital hairstyle pictures! Do you have any dance recitals coming up this month?! Feel free to share your photos on the Curly Hairdo Ideas facebook page! I LOVE seeing all your styles and sharing in your moments!